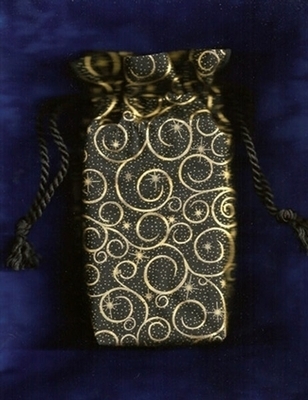 Double Draw Tarot Bags - Stellar Spiral Double Draw Bag - Tarot Bags, Tarot Cards, Cloths, & More! 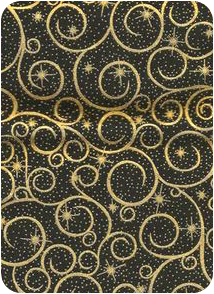 Gilded gold spirals and starbursts decorate the black fabric of this elegant tarot bag, making it completely ideal for almost any divination deck that has either gilt accents, a celestial theme, or curved lines in the card illustrations. This darkly mysterious bag is perfect as a gift because any deck would seem appropriately housed in its cozy interior. Size: The double draw tarot bag is 7-1/2 x 5 x 1 inches. It fits most standard sized tarot decks that are up to 3-1/4 x 5-1/2 inches. There is an one-inch ruffle on top and an one-inch gusset (tote style) at the bottom. It is made of cotton and closes with two black twisted cord drawstrings.